IBS Electonics Printed Circuit Board Manufacturing. Printed circuit boards are fascinating things. From a complex multi-layer board to a double sided surface mount design, our goal is to provide you a quality product that meets your requirements and is the most cost effective to manufacture. We offer high-quality printed circuit boards fabrication, assembly and parts sourcing services supplier. Since our establishment, we have helped thousands of engineers, and purchasers from businesses. 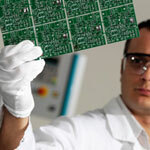 We do our best to ensure our PCBs meet and exceed specific requirements of each and every one of our customers. IBS Electonics preserves its position in the market of high mix low/medium volume with fast delivery to produce high quality level of printed circuit board up to 20 layers. The notion of "Speed” is echoed throughout the whole company management activities. "Service Beyond Expectation" is our persistent customer service philosophy. Fast and on time delivery with high quality is the advantage and characteristic of the competition. IBS Electronics Circuits gets the U.S. UL Safety Certificate (UL File No: E301546) including normal FR4 material, aluminum base and high-frequency Rogers material and has the perfect ISO9001 Quality Management System approved by SGS. In addition our products meet the RoHS standard certified by the SGS. IBS Electronics offers High quality Printed Circuit Board fabrication and assembly. A printed circuit board (PCB) mechanically supports and electrically connects electronic components using conductive tracks, pads and other features etched from copper sheets laminated onto a non-conductive substrate. Single sided PCBA using a single sided PCB, as well as double-sided assemblies using PCBs of 2 to 20+ layers. We pride ourselves in taking care of complex projects consisting of high technology, multi-layer boards. Any cable harnesses or wiring that may be required for certain product assemblies. We may outsource the production of these items, but Assembly House, Inc. will work with you to conveniently meet all of your Printed Circuit Board assembly requirements. CEM-1 Composite material composed of woven glass fabric surfaces and paper core combined with epoxy resin (as is typical in the Printed Circuit Board industry). CEM-1 provides excellent mechanical and electrical properties, and punches well up to .093”. component technology - we typically use HASL (Hot Air Solder Leveling). For high level product technology - Printed Circuit Boards are assembled with fine pitch or BGA - we usually specify ENIG (Electroless Nickel Immersion Gold) or IAg (Immersion Silver). A BOM (Bill of Materials) with reference designators: component description, manufacturer’s name and part number. A PCB fabrication drawing and PCBA assembly drawing. Any mechanical restrictions such as assembly height requirements.